Now let’s get one things out of the way. The world is filled with a myriad of issues. This past week in the states, we’ve seen tragedies realized and attempted in Pittsburgh, Kentucky and against noted Democratic political figures/supporters. There are refugees seeking very legal asylum being painted as very illegal and violent caravans by the administration and voter disenfranchisement in states like Georgia and Texas. These and many other issues plaguing our contemporary landscape make considering anything less dire to be both callous and tone deaf. You can find out where you can vote, whether you can vote early, whether you’re registered and even how to become registered. Yeah I know I’m just supposed to talk about games but when I sat down at my keyboard, I couldn’t help but get my latent anxieties off my chest before talking about another important but less dire situation. Okay. With all those moral consequence stuff out of the way… Let’s talk about video games!… and their moral consequences. (I’m not trying to be a downer, I swear). Now, unless you’ve been living under a rock in the ACTUAL old west, you’ve probably heard about the release of Red Dead Redemption 2. 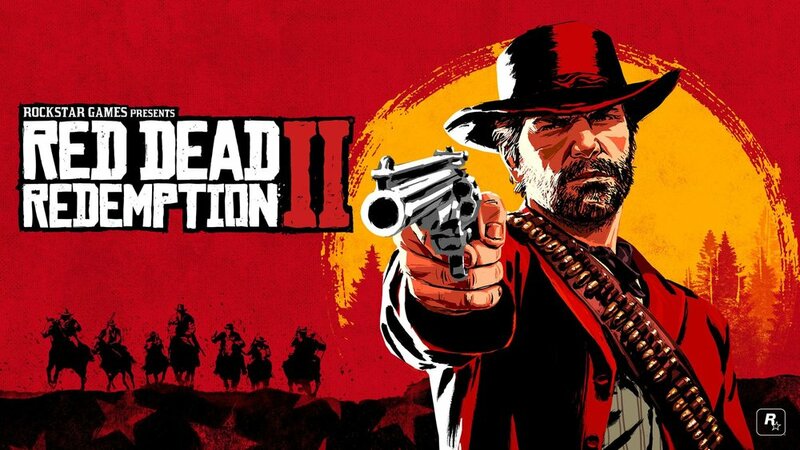 Alright, animal genitalia aside, RDR2 (Red Dead Redemption 2), the successor of Rockstar’s original Read Dead Redemption on the Xbox 360 and Playstation 3, is an impressive game. With nearly perfect Metacritic scores, the only other games that compare in terms of their near universal acclaim come across the ESRB divide with Nintendo’s Super Mario Odyssey and Legend of Zelda: Breath of the Wild. The fact that RDR2 has been basking in the limelight of 10/10’s is great. Hard work and attention to detail (even some gross details) deserves recognition. Especially when that hard work includes 100 hour work weeks. Keep in mind, there are only 168 hours in a full week. And to finish this masterpiece, programmers, designers, and writers had to relinquish more than half of not their daily existence to intricate details (Yes, there’s a horse joke in here. However, that’s low hanging fruit. I’m better than that (OvO) ). There is no way that 100 hour weeks are efficient. There is no way that after 1 of those weeks that any employees could be in a remotely healthy state. There is also probably no way that when Dan Houser (Rockstar Co-founder and game producer) said “We were working 100-hour weeks” that he thought that there would be ANY media pushback to what has been essentially thought of as an industry norm. This isn’t the first time I’ve talked about crunch in the game industry and it probably won’t be the last. I’m pretty sure when Houser talked about the extraneous work hours, it was a little bit of a brag. Not in a snide or mean sort of way. Just a metric that people in the industry know is indicative of dedication to the craft of game making. In the interview with Vulture, Houser talked about the complexity of NPC’s having pages and pages of code and how all the hard work put in makes the game “…a vast four-dimensional mosaic in which the fourth dimension is time”. All of the detail, artistry and digital craftsmanship SHOULD be celebrated, but not at the expense of the craftspeople in question. Historically, this has not been the widespread opinion on game development. However, some things are very different now then they were even a few years ago regarding overwork and game development. Some people are actually mad that it still happens. It’s interesting to see how that opinion is slowly changing. But it is only some and very slow. Articles from big names like talking about the game after its release only briefly mention, if at all, the small uproar created when Houser mentioned work hours. To be completely fair, unlike with the Telltale closing, we’ve gotten positive employee feedback from people who have worked for Rockstar for many years. Their comments go against the notion that they have ever been overworked, which is an honest relief. Overtime might be inevitable in the AAA game space but overtime is not the same as overwork and when scrutinized it appears that Rock Star, in spite of Houser’s original communication misstep, is not overworking employees. Not pressing the issue and only talking about the success of the game might seem like a cop-out to some. But the simple fact that a producer bragged about long hours and a lot of people were angry instead of proud marks an important shift in public opinion. Even if we were only angry for a day, the fact that we — as a community — cared at all is a step in the right direction.